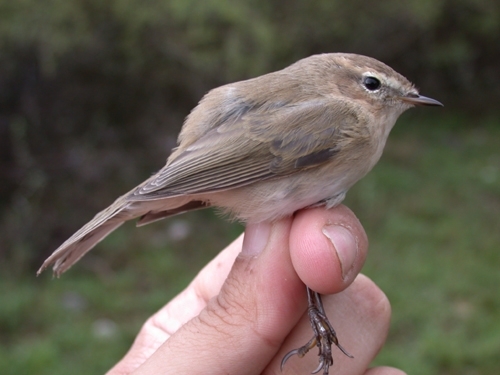 Plate 1: 'Siberian Chiffchaff' Phylloscopus collybita tristis, Ebro Delta, Spain, 19th October 2005 (David Bigas). "First-year bird, with black legs and black bill, which is only very slightly paler at the base of the lower mandible, ochre supercilium relatively short and smoky ear-coverts. Green restricted to edges of tail- (rectrices) and wing-feathers (primaries and outer secondaries) and wing-coverts. No yellow in face and eye- ring. Undertail coverts and belly white." 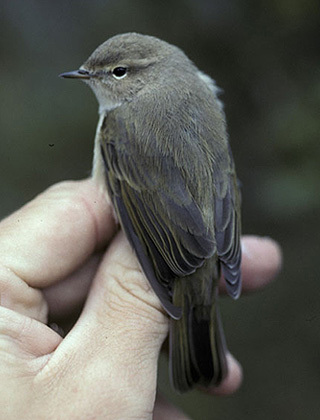 Plate 2: 'Siberian Chiffchaff' Phylloscopus collybita tristis, Ebro Delta, Spain, 13th April 2003 (David Bigas). "Adult bird with deep black bill and legs. Edges of mandibles horny-coloured. Only faint supercilium without yellow. Primary projection relatively long. Eye-ring and underparts pure white. Tips of greater coverts pale, forming an slight wing-bar which is just visible. Whole plumage abraded so that green fringes have worn off. Compare with the fresher looking plumage of the autumn bird in plate 1." Plate 3: Mountain Chiffchaff Phylloscopus sindianus lorenzii, Gelinkaya/Erzurum, Turkey, May 2005 (José Luis Copete). "Despite short supercilium and slight contrast between head and mantle, this bird has been identified as lorenzii, because the overall brownish tones on upperparts, dark bill and tarsus, and almost general absence of green tones in the plumage. It should be noted, however, that this bird and others trapped on the same site on the same day showed yellowish underwing coverts, and olive-green tones on edge of flight feathers, features which are also present in this species despite some published illustrations in which they are not so apparent." "This could easily pass for tristis if observed in western Europe but it is difficult to eliminate Mountain Chiffchaff Phylloscopus sindianus. 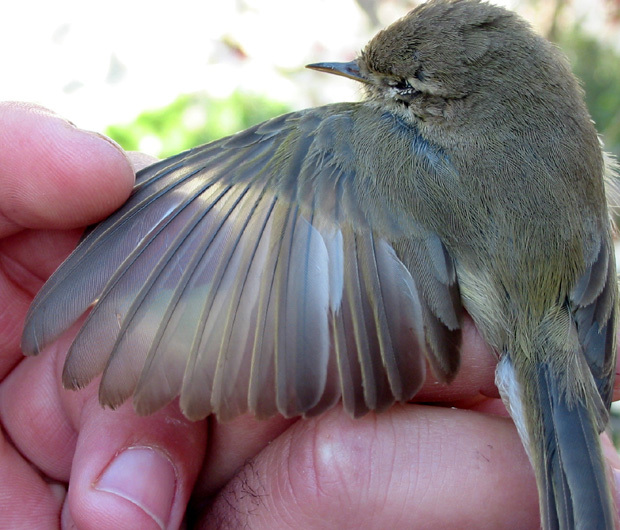 Svensson, in his Identification Guide to European Passerines, indicates that a lack of olive fringes to the flight feathers differentiates Mountain Chiffchaff from tristis. In the photo, I cannot detect olive fringes on the edges of the flight feathers. 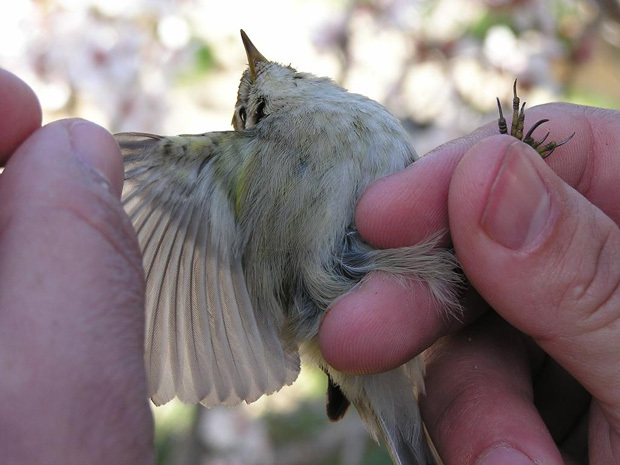 However, José Luis Copete indicates that, in the field, there was a hint of olive fringes to the flight feathers and suggests that this can occur in Mountain Chiffchaff, contra Svensson." 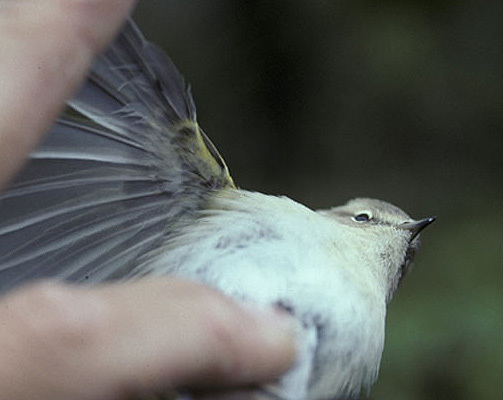 Plate 4: 'Siberian Chiffchaff' Phylloscopus collybita tristis, Hanstholm, Danmark, 8th October 2004 (Jimmy Skat Hansen). "The formulation on the Danish Rarities Committee's website means that records of tristis chiffchaffs were considered by the DRC until 1993 but not since. Only records of handheld birds not showing any yellow except on the underwing-coverts were accepted by the DRC. I have pasted in below an attempt to translate the Danish text from the picture info at www.netfugl.dk/pictures.php?id=showpictureπcture_id=4251: Tristis or just another subtristis? 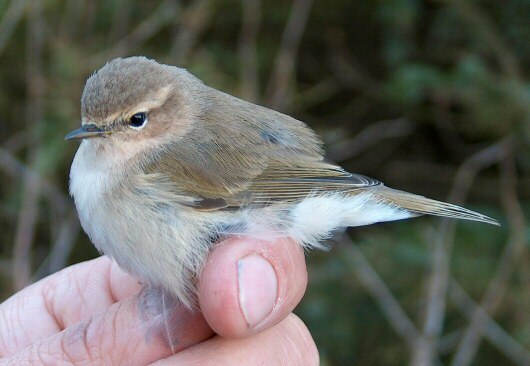 Picture info: On 8th Oct 2004 I found this (tristis) chiffchaff by my ringer's net. It was observed a couple of times before it flew into a mistnet. The call was not heard in the field, but many times in the hand. The call was recorded on video. The following measurements were taken: wing length 55mm, tail 54mm, bill tip to skull 11,2 mm, tip to nostril 5 mm, 1p = 7mm, distance 1p til 2p = 22mm, 2p= 8 8/9. The underside was pale white/buff without any trace of yellow. There was no trace of yellow in the eye-brow. The only yellow on the bird was at the wing bend and a little on the underwing, which is acceptable on a tristis. With the bird in the hand, we agreed that crown, nape and back were uniformly brown, with the only green on wings and tail. 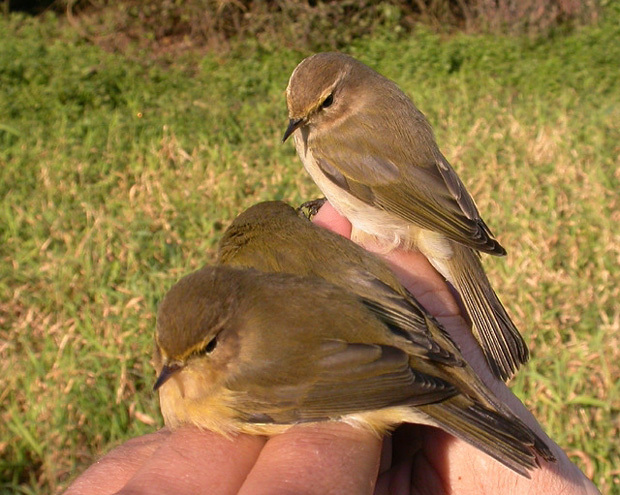 The call was very similar to the tristis -call on the CD Eastern Vagrants. The pictures were taken with full sunlight on the bird. My immediate impression is that this individual looks like a tristis and with the addition of a typical call (though this is not directly described), but other members of the DRC may have other views. I have myself heard a similar looking bird singing the typical tristis song in October in Denmark." "A good tristis, totally devoid of yellow away from the underwing, with evident brown component in upperparts, and with rusty-buff on supercilium, the sides of the breast and flanks, and on the ear-coverts, which are also quite dark. Judging from the skins at Tring it is not unusual for tristis to show a little pale at the base of the lower mandible." "This bird I would call tristis. It is a bit pale beneath for classic tristis, but I estimate this is due to slight overexposure. It has the right kind of rufous-buff tinge to supercilium and ear-coverts. I can see no yellow in the face or below, and no green on mantle or crown." 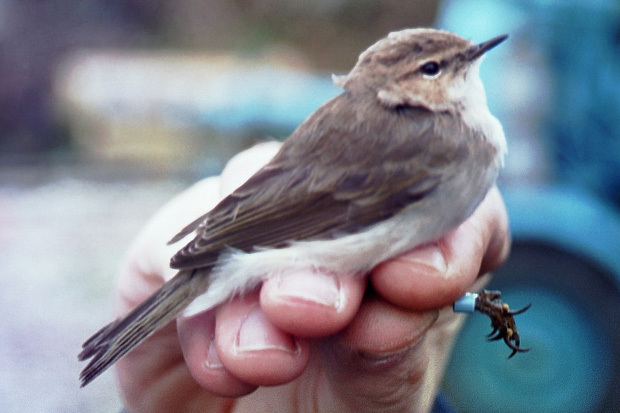 Plate 5: 'Siberian Chiffchaff' Phylloscopus collybita tristis, Cornwall, England, January 2003 (Greg Conway). "This photo appears to be 'brown-biased' to my eye and I suspect it is deficient in yellow/green. That said, the brown and buff appearance, and especially the rusty-buff suffusion on the supercilium and ear-coverts, indicate that this is indeed a tristis. Given the locality (Cornwall, UK), Mountain Chiffchaff Phylloscopus sindianus can safely be excluded though not on the basis of the photos which appear to lack olive entirely including on the fringes of the flight-feathers." "This should be tristis, judging from rusty-buff tinge on supercilium and sides of head, and lack of yellow or green on head and underparts. But the photographs are of rather poor quality and some artefacts as to paleness and colours cannot be ruled out." 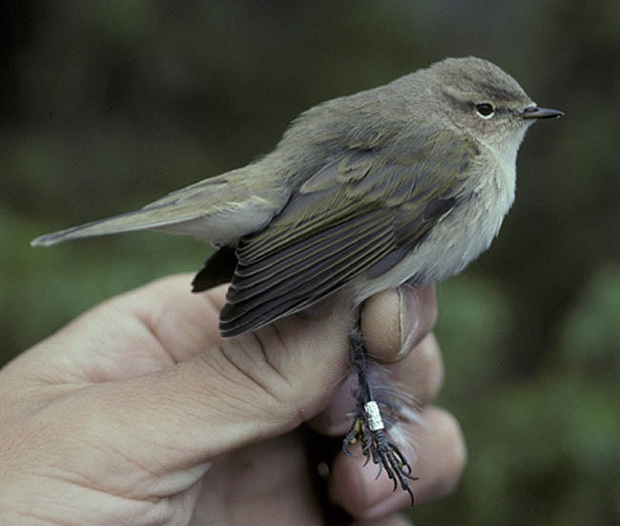 Plate 6a-c: 'Siberian Chiffchaff' Phylloscopus collybita tristis, Signilskär, Finland, 16th October 2000 (Jari Korhonen). The upperparts were quite uniformly brownish-grey from forehead to upper tail coverts, although rump seems a bit lighter in some photos and there is white on the forehead where the supercilia meet, just above the nostrils, no yellow at all in supercilium or in the broken eyering, the light tips of the greater coverts formed a faint wingbar. The original photos were filmed on Kodachrome 64 and scanned with high resolution. One must also take into consideration the fact that the colour settings of the monitor affect greatly the colours of an image on the screen, especially when poorly set. This particular individual called in the hand a few times ("iip"-call). The call was reminscent of the alarm call of Thrush Nightingale Luscinia luscinia in tone, but much fainter, of course. This observation was accepted by the Finnish Rarities Committee on the basis of a set of prints and detailed description." 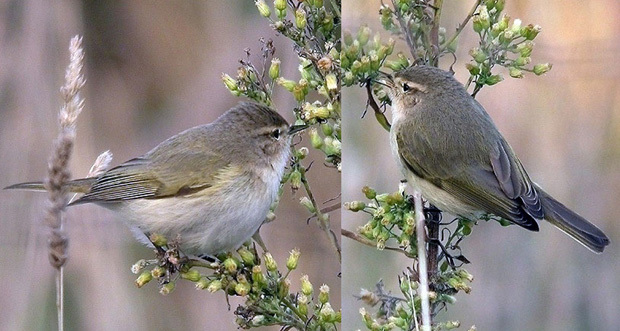 Plate 7a: 'Siberian Chiffchaff' Phylloscopus collybita tristis, Yerusalem, Israel, 26th February 2005 (upper: Itai Shanni, lower: Yael Lehnardt). Plate 7b: 'Siberian Chiffchaff' Phylloscopus collybita tristis, Yerusalem, Israel, 26th February 2005 (Itai Shanni). 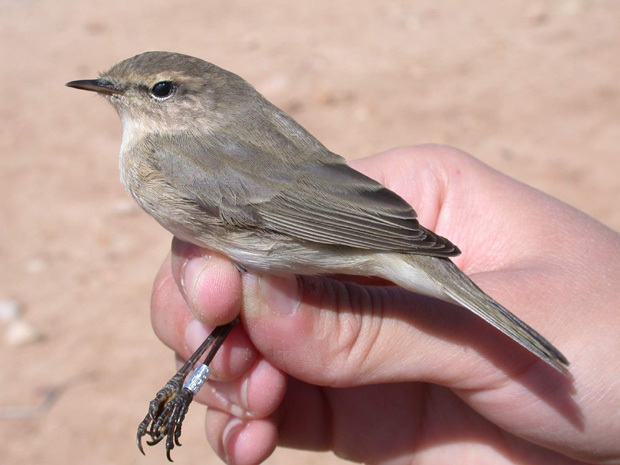 Plate 7c: 'Siberian Chiffchaff' Phylloscopus collybita tristis, Yerusalem, Israel, 26th February 2005 (Yael Lehnardt). "Once again these two photos illustrate how variable - and deceptive - photographs can be in terms of colour authenticity. Judging by the colour of the 'fingers' in all the photos, I doubt whether any of these photos are truly accurate in terms of the bird's actual colours. Thus, my repeated proviso applies: that all comments are based on the "apparent" colours etc, as in the photos, but in fact these may not be reliable. That said, the secondaries appear to show subdued olive fringes, similar in hue to those apparent on the tail feathers. Combined with the generally brownish-grey upperparts and the extensive deep buff hue on the supercilium, cheeks and underparts, this should be OK as tristis. Perhaps the bill looks a little longer and more spiky than is usual (and with quite an extensive amount of pale on the lower mandible), while the underparts appear to be rather concolorously buff, producing a duller and more sombre appearance, which lacks the whiter central underparts normal in tristis. There is nothing in its appearance to indicate 'fulvescens '." Plate 8a,b: Chiffchaff Phylloscopus collybita showing characters of the Siberian form tristis, Ile de Noirmoutier, Vendée, France, 25th November 2004 (Matthieu Vaslin). "Call", Ile de Noirmoutier/Vendée, France, 25th November 2004 (Matthieu Vaslin). "The French Rarities Committee only accepts well documented singing (sound recorded) birds or birds in the hand as belonging to the tristis/'fulvescens' group. Unfortunately I had a problem with the colour resolution of my camera, so the image on the right side is too yellowish. Indeed the bird was very grey with a cream supercilium, had all black bill and legs, a dark alula, a cream white breast and belly, a trace of green on the mantle and scapulars, a small wing bar and a greenish wing patch as in Bonelli's Warbler Phylloscopus bonelli, but not as marked. So the bird was not as yellowish as shown in the right part of the plate. The bird on the left is much closer to the original impression. The call was very like that of a chick. For me all characters are good for a bird from the Siberian range even though it might not be a true tristis." "In the left photo of plate 8a this looks quite good for tristis but there is rather too extensive yellow at the sides of the breast in the left part of plate 8b. Also, rusty-buff is confined to the supercilium and ear- coverts, with very little if any at the sides of the breast or on the flanks, with the underparts appearing rather uniformly pale as a result. These features suggest that this individual might better be regarded as 'fulvescens'. Experience shows that photos which are not colour neutral (and that includes a high percentage it seems!) can give very misleading impressions and very easily suggest the 'wrong' subspecies. The call is that of tristis, so the bird is certainly from the range of tristis/'fulvescens' or the zone of sympatry of tristis and abietinus where it seems likely that some eastern abietinus may also give a tristis -like call." Plate 9: Chiffchaff Phylloscopus collybita, Warwickshire, England, February 2005 (Steve Seal). 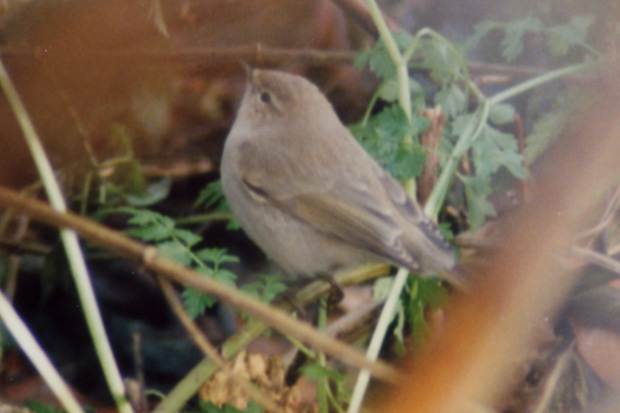 "In Dean & Svensson (2005) and in correspondence with Lars Svensson and Andreas Noeske I have mentioned how photos of chiffchaffs can be misleading, as photos of the Warwickshire chiffchaff (pp. 406-407) which I received from various photographers showed an alarming variation. Some photos looked nothing like the bird in life, in terms of colour. Several photos looked very brown and buff, and could easily be taken for tristis, whereas the bird in life was in fact very grey and white, did not look at all brown and buff, did not look at all like a (true) tristis, and was almost certainly an eastern abietinus. At the time Lars Svensson and I were working on the BB paper there did not seem any point in emailing photos which wrongly depicted the bird! However, given the current photos circulating in relation to Andreas' and Ralf's web-based article, it may now be worth resurrecting one of the photos as an example of how misleading photos can be, and to demonstrate why I am so cautious. Hence I have made up a composite image which is shown here. 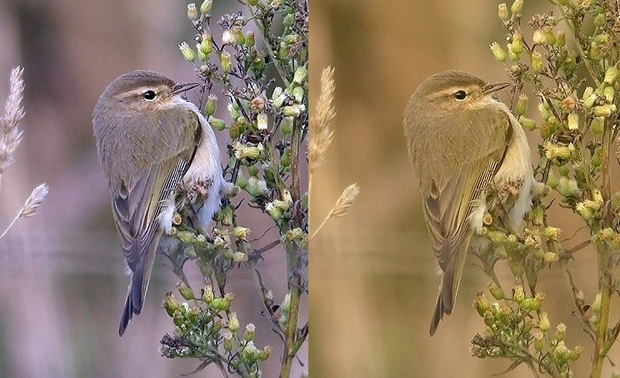 On the left is an excellent image of the Warwickshire chiffchaff as it truly appeared in the field. On the right is another photo which, although admirably sharp, completely misrepresents the colours of the bird, making it look much too brown and buff. Note that these two photos are of the SAME bird and taken by the SAME photographer (Steve Seal). 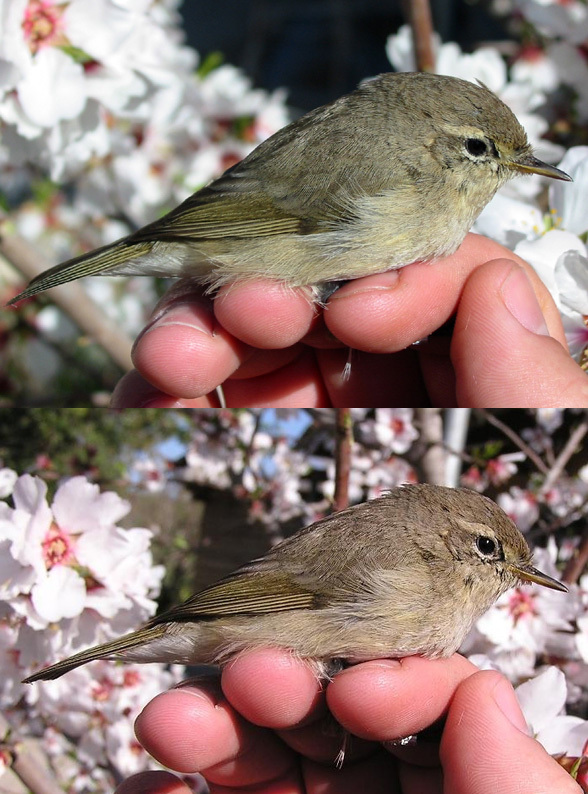 Looking at the right hand photo overall, and taking the background into account, it is clear that it is brown-biased and olive/yellow deficient but, if taken at 'face value', it could easily be identified as a pale example of tristis. This effect results no doubt from the ambient light conditions, and is beyond the direct control of the photographer. It is, I suspect, at work in some of the photos circulated for this paper. Overall, this series of photographs confirms my impression that diagnosing chiffchaffs from photographs is fraught with difficulties and likely to be error-prone. I am firmly of the opinion that rather few photographs provide a truly accurate colour representation and, as the balance of hues such as brown, grey, olive, buff and yellow are critical in the diagnosis of subspecies, this is a major short-coming. Thus, only where images are of the highest standard and where the background etc indicate that the 'colour balance' is accurate, do I feel at all confident in assigning birds as tristis." Plate 10: Chiffchaff Phylloscopus collybita, Needingworth, England, February 2004 (Rebecca Nason). "These two photos of the same bird well illustrate the problems with colour balance in photos! 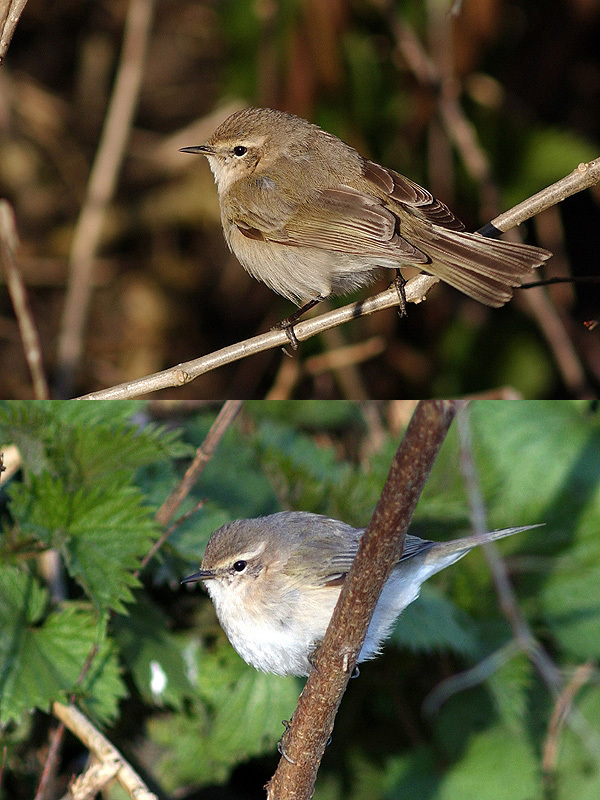 Whereas the upper photo might suggest tristis or 'fulvescens', the lower one does not and suggests a paler and greyer appearance. The upper photograph looks 'brown-biased' to my eye. Conversely, the lower photo is much over-exposed and any colour on the underparts will be ‘burnt out’. It seems highly likely that its paler and greyer appearance derives from over exposure and that it does not equate with the genuinely grey-and-white chiffchaffs typified by the Warwickshire/UK bird in ‘Dean & Svensson’, (the characters of which I suspect may not be adequately embraced by current taxonomy). Thus, it is difficult to pass judgement on this individual. 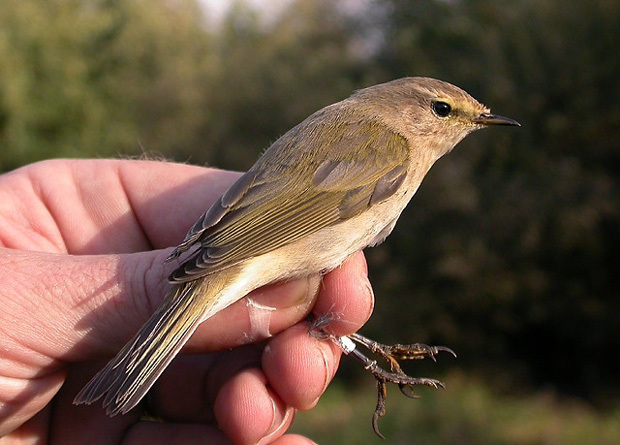 Though it is undoubtedly an ‘eastern chiffchaff’ evaluation of the true extent of olive, yellow and buff is not possible." "The Needingworth bird here does not look quite good for tristis. It is either of 'fulvescens', intergrade 'fulvescens' -abietinus or very dull and brown abietinus. I would opt for one of the first two mentioned alternatives based on the rather obvious rusty-buff tinges on ear-coverts and (lighter though) on supercilium." 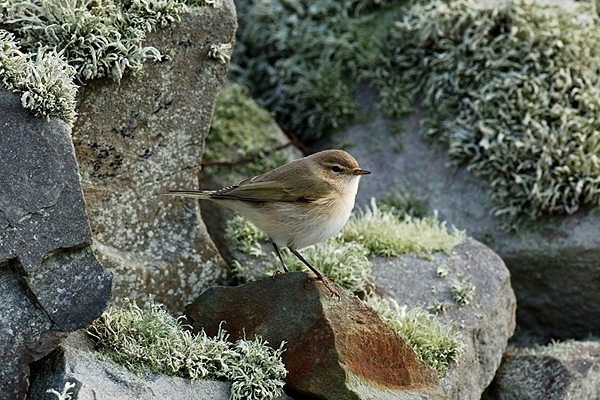 Plate 11: Chiffchaff Phylloscopus collybita showing characters of the Siberian form tristis, Fair Isle, Scotland, October 2004 (Rebecca Nason). "The Fair Isle bird is like tristis but, like the bird photographed by Matthieu Vaslin, has perhaps too much yellow at the sides of the breast (and perhaps a hint above the eye?). If this is a true likeness then it is better classified as 'fulvescens' I think." Plate 12: Chiffchaff Phylloscopus collybita, Rotterdam, The Netherlands, 27th November 1998 (Chris van Rijswijk). According to Chris van Rijswijk this bird's call sounded "clear, loud, regular and 'as a chicken who is calling his mother'". 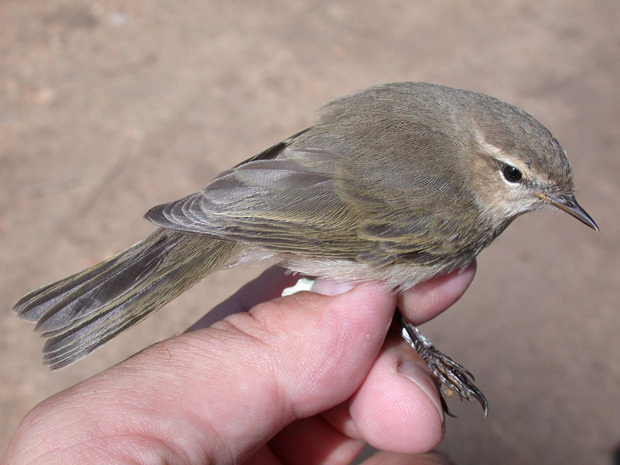 It was accepted by the Dutch Rarities Committee CDNA as 'Siberian Chiffchaff'. "Although on first sight the impression is of a tristis -like chiffchaff, I am wary of this photo as it is not sharp and I suspect it is not 'colour neutral' either. This is a constant problem in evaluating photos and a series of photos of the same individual can produce quite different impressions and even suggest different subspecies. As already noted, olive, brown and yellow hues are very often lost or exaggerated in all but the clearest and sharpest photographs. On this bird, the olive wing-panel appears to contrast rather strongly and looks diffuse, while the colour of the upperparts and supercilium do not appear 'precise'. Thus I would hesitate to attribute this individual." Plate 13a-c: Chiffchaff Phylloscopus collybita, Bouaye, Loire- Atlantique, France, 6th November 2005 (Matthieu Vaslin). "On the basis of the photos, this looks like an 'intergrade'. There is rufous-buff on the ear-coverts in at least one of the photos. It is perhaps a bit too pale and too extensively olive to be described as 'fulvescens' in the strictest sense discussed in the BB paper and 'intergrade abietinus/tristis' seems the better description, with tristis used sensu lato (i.e. so that the term 'intergrade' encompasses abietinus/'fulvescens')." We would like to thank David Bigas, Greg Conway, José Luis Copete, Sameh Darawshi, Jimmy Skat Hansen, John Judge, Jari Korhonen, Yael Lehnardt, Dominic Mitchell, Rebecca Nason, Steve Seal, Itai Shanni, Lars Svensson, Kasper Thorup, Christian Tiller, Chris van Rijswijk and Matthieu Vaslin for supplying photographs, comments or other information. Svensson, L. 1992: Identification Guide to European Passerines. 4th edn. Stockholm. Noeske, A. & A.R. Dean 2006: 'Siberian Chiffchaff' in Europe: Photo-Forum.